But if you want to guide your customer to a concrete leveling repair solution, you should also be able to illustrate the pros, explain the cons, and enunciate the selling points. Concrete, a mixture of cement, sand and aggregates, weighs on average 150 pounds per cubic foot, and high-density concrete can weigh in at 300 pounds or more. Any material used to serve as an elevating cushion of support between concrete and soil is literally caught between a rock and hard place – the concrete and the natural soil on which it rests. By definition, structural foams need only be strong enough to heft sinking slabs back to level ground and durable enough to stop them from sinking again once cured. But polyurethane foams are actually one of the most resilient foundation repair solutions ever innovated. Rated on density and compressive potency, the strength-to-weight ratio of lifting foams is staggering. 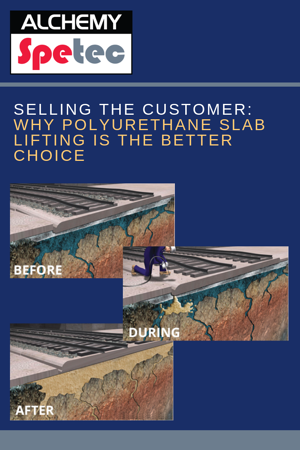 Successful applications include airport runway and railway bed repair projects – in other words, structural polyurethane slab lifting foams like AP Lift 475 are heavy-duty enough to support the lift-off and landing of a 747 or the constant travel of a freight train. Demo and rebuild or rethink and repair – these are, generally speaking, the two available resolution options when shifting soils give way under structural foundations and existing slab work. When possible, remediation repairs for settling concrete require far fewer resources than reconstruction. Traditional mud jacking, which requires hydraulic pressure to inject mud into the void or weak soil beneath the slab, can’t hold a candle to the power or expanding, high-density polyurethane foam. Lifting foams are injected in bursts and rapidly expand 15-25 times or more the original volume, filling voids or strengthening soil in the affected space and creating comprehensive support. These stronger-than-bedrock polymers also subdue the kinds of stress points that mud jacking applications can create, eventually causing cracking and a second round of expensive repair work. Another contrast with traditional mudjacking materials is the fact that polyurethane does not shrink or wash out over time, saving property owners the extra cost of re-treating the problem at a later date. Slab lifting foams don’t just save money, they save time. Because of their expansion properties, they can be applied quickly to lift slabs, and curing doesn’t require the same amount of time as other solution applications, such as mudjacking with cement slurry. That means a seasoned slab lifting technician can deliver project completion – with drive-on capability – in a much more efficient manner. Depending on contingencies and project timelines, that savings alone can be worth its weight in gold to potential customers.